Today I have a vegan-friendly recipe for you and I hope it will also make happy those of you who have decided to take the New Year’s resolution challenge and start to eat healthily. Especially breakfast is very important and should not be skipped as it gives your body the energy needed for a good start of the day and if your breakfast is yummy, then you can have really a wonderful morning, right? 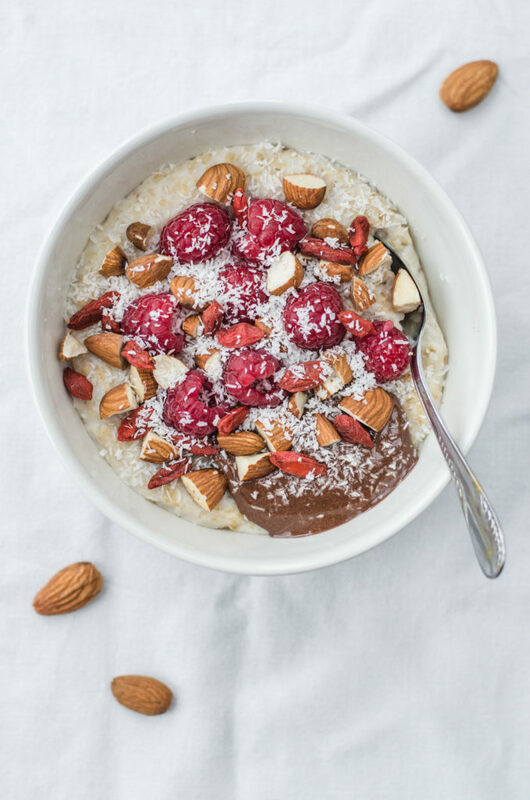 And so here is my Almond Cacao Oatmeal with Raspberries, Goji and Coconut which is both delicious and will nourish your body with vitamins, minerals, antioxidants, and fiber. 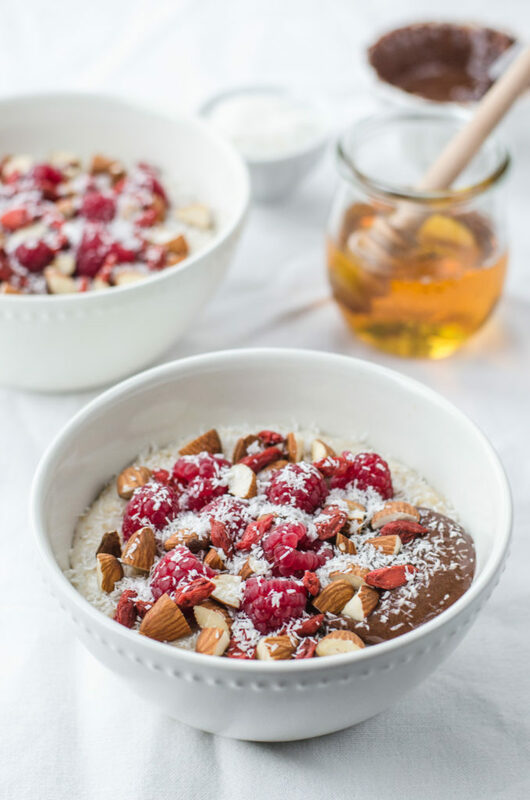 What I love about oatmeal breakfasts in general, is that it keeps me running the whole morning – you shouldn’t be hungry until lunch, as they are rich in complex carbohydrates. This is one of the recipes that I prepared initially for the Goji Cookbook e-book (unfortunately available only in Czech language, sorry guys) packed with 40 easy and healthy recipes with goji berries from Czech and Slovak food bloggers. Goji berries are a kind of a super food as they are very healthy! The Chinese know about goji berries since already 2000 years but they have only been introduced in Europe quite recently. And what are their health benefits? Thanks to the high content of antioxidants, they protect the cells of our bodies against the free radicals and degeneration. They contain some germanium which strengthens our immune system. Goji berries also support detox, help to reduce body weight and high blood pressure for example. And guess what, they are even used in prevention and treatment of cancer. So let’s prepare this yummy and healthy breakfast! 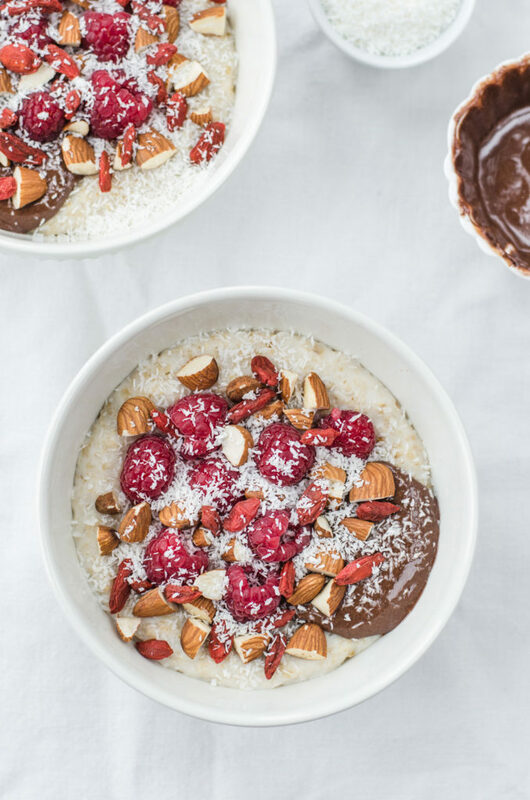 Here is the recipe and if you make it, do let me know how you liked this almond cacao oatmeal with raspberries, goji and coconut! A delicious and healthy breakfast for a great start of the day! Place rolled oats, almond milk, water and salt in a small saucepan and bring to boil. Lower the heat and simmer for 3-4 minutes until it thickens. Add the agave syrup. In a small bowl, mix together the almond butter with cacao powder. Halve almonds. 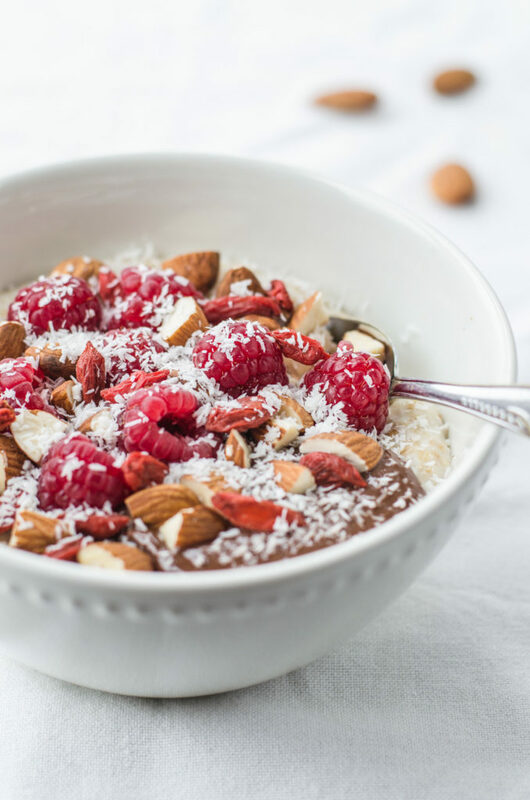 Pour the oatmeal into bowls, add a tablespoon of the almond butter and cacao mix and sprinkle with raspberries, goji, halved almonds and shredded coconut. I love the combination of fruits and oats. This combination is not only healthy but tasty too. I’ll definitely try this recipe. Thanks for sharing this! ? This looks delicious, thank you for sharing the recipe I am so going to give this a try. That looks delicious. I am a huge fan of fruit on my oatmeal. I also like nuts in my oatmeal, but I’ve never considered adding coconut before. I think this will be a great addition to my breakfast repertoire. Looks really yummy! I am so going to the market to get the ingredients, I have to try this!